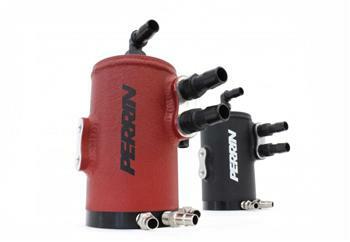 The PERRIN Performance Air Oil Separator traps oil from the crank case vents before it enters the intake, thus increasing intercooler efficiency and reduces chances of performance-robbing detonation. The AOS increases intercooler efficiency by reducing the amount of oil deposited into your intercooler and intake system! As blow-by/oil builds up inside your intercooler, the less efficient it becomes due to less heat being transferred away from your engine. This leads to power loss and detonation, which can be damaging to your engine. Reduce carbon build up in the combustion chamber, intake valves, and in your intake tract. Crank case blow-by is recirculated back to the intake to be ingested by the engine, but in doing so, gets stuck in the intake tract, intake valves, and the intercooler. This builds up over time which causes a loss in power and extra wear and tear on your valve train. The octane level of oil is very low. Anytime there is a significant amount of engine blow-by (oil) being put back into your engine, it reduces your fuel’s octane level leading to detonation or knock, which will cause loss of power and engine failure. We designed the PERRIN Air Oil Separator kit based on the idea that using a PCV on the AOS outlet ensures proper crank case venting during light loads and helps reduce unwanted blow-by gases into your intake system. Incorporating a PCV reduces the smell from exhaust and keeps your intake tract clean. Over the years, a slight buildup may occur inside your AOS. This can be quickly taken care of by removing one bolt to access the inside for cleaning. This small feature is one of the many things that makes the PERRIN AOS stand out from the rest. The base plate of the the AOS is heated by coolant drawn from the engine. By keeping the AOS the same temperature as the engine and blow-by gases, water condensation is decreased allowing oil and water vapor to separate and pass through the can. This vital feature eliminates nearly all the sludge that can build up in the AOS body, which drastically reduce how often you must clean it. Powder coated for protection against the elements, the textured finish will look awesome for years to come. The PERRIN AOS is available in black or red texture powder coating.